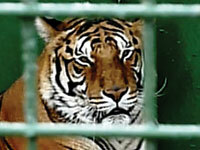 Some reports claim the UK has already banned the use of wild animals in circuses. This is not correct; the bill has been in committee and ADI recently fought off attempts to dilute it. At the start of 2013, the long-awaited British legislation to ban wild animals in traveling circuses was unveiled, following a decade of twists, turns, broken promises, numerous investigations and exposés from ADI (most recently poor Anne the elephant), and throughout, overwhelming public support for a ban. But there was to be another twist. In the summer the Parliamentary Environment, Food and Rural Affairs Committee (EFRA) recommended reducing the scope of the ban to just big cats and elephants. EFRA claimed, without evidence, that these were the only species the public cared about and species like zebras were no different to horses. ADI fought back with a detailed response presenting scientific evidence for including all non-domesticated species in the ban and opinion poll data showing the public support. In fact polls consistently show that the majority of British people favor a ban on ALL animals (including horses, dogs etc.) in circuses. ADI met with the Minister, Lord de Mauley, and presented our findings with a Mark Pritchard MP. EFRA’s proposals were rejected and the British Government will present to Parliament a bill to ban all performing wild animals by 2015. However the delays have, as we feared, seen Thomas Chipperfield bring two lions and four tigers from Duffy’s Circus in Ireland to Jolly’s Circus in the UK (pictured at top of page). There are some clarifications to resolve, such as animals claimed to be non-performing, and MPs are taking up this issue. We finish the year closer to a British ban but ADI will not be celebrating until it is actually passed.